(CNN) -- The White House remained neutral on the re-election of Iranian President Mahmoud Ahmadinejad, praising the spirited debate among voters, but joined Canada on Saturday in saying it is monitoring reports of irregularities. The president's main rival Mir Hossein Moussavi said there were "blatant violations" in the election. Ahmadinejad was declared the winner with 62.63 percent of the vote, but his chief rival, reformist Mir Hossein Moussavi, and his supporters are accusing the incumbent of voter intimidation and fraud. U.S. Secretary of State Hillary Clinton said the United States is "waiting and watching to see what the Iranian people decide. "The United States has refrained from commenting on the election in Iran. We obviously hope that the outcome reflects the genuine will and desire of the Iranian people," she said. White House spokesman Robert Gibbs said in a written statement that the U.S. is watching the situation. "Like the rest of the world, we were impressed by the vigorous debate and enthusiasm that this election generated, particularly among young Iranians," Gibbs said. "We continue to monitor the entire situation closely, including reports of irregularities." Canada's foreign minister said Canada's government was troubled by accusations that the election was unjust. "Canada is deeply concerned by reports of voting irregularities in the Iranian election," Canadian Foreign Affairs Minister Lawrence Cannon told reporters at a briefing in Niagara Falls, in Ontario, Canada, with Clinton. "We're troubled by reports of intimidation of opposition candidates' offices by security forces," he said. "We've asked our embassy officials in Tehran to closely monitor the situation, and Canada is calling on Iranian authorities to conduct fair and transparent counting of all ballots." After a presidential debate between Moussavi and Ahmadinejad riveted the nation, Moussavi's campaign caught fire in recent days, triggering massive street rallies in Tehran. 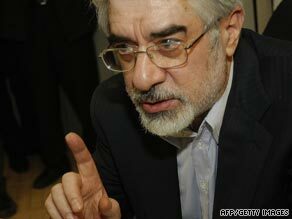 Analysts expected Moussavi, widely regarded as a reformist, to do well. CNN's Christiane Amanpour said she saw riot police fighting "running battles" with protesters, who were shouting "Death to dictatorship!" In Washington, about 40 protesters gathered outside the Iranian Interests Section to bring attention to what they say is a stolen election. "People have gathered here to express their distrust of the government in Iran, which has really turned a very genuine election into a sham and has basically stolen people's votes in order to maintain a regime that is seriously not wanted by the Iranian people," protester Robert Babeyi said. Babeyi said he moved from Iran to the United States more than 30 years ago but stands behind those Iranians who he feels have been wronged. "We are hoping the voices of Iranian-Americans here are heard throughout the world and can express our solidarity for the people of Iran, that we are with them and we understand that they are cheated," Babeyi said.